INTERVIEW: DOROTHY MASSEY was shortlisted for our Children’s Novel Award for Red God/Black God, her self-published novel about a teenage Maasai girl who takes a stand against her village’s traditions. Dorothy is a Literacy and Creative Writing tutor and has an MA in Writing for Children from the University of Central Lancashire. Your novel began life in a notebook stuffed inside your bag on a trip to Kenya. Did a specific person or moment provide the story’s spark? I think the idea germinated before I even got to Kenya, actually. I’d visited Zambia the previous year, and went to Kenya hoping to find inspiration for a novel which I would begin to write as my dissertation project. On visiting schools in both Zambia and Kenya, I was struck by the value placed on education, and when the opportunity arose to visit Kimana Secondary school, I went armed with a list of questions to ask the students. Many of their answers surprised me, especially when several of the boys stated corruption as being top of the list of things they didn’t like. Although I wasn’t aware of it at the time, one girl’s disclosure that she hoped to become a doctor and perhaps discover a cure for AIDs played a significant part in forming the premise of my story. Several other experiences during the visit became encapsulated into the novel and I plan to write about some of these inspirations in my blog. 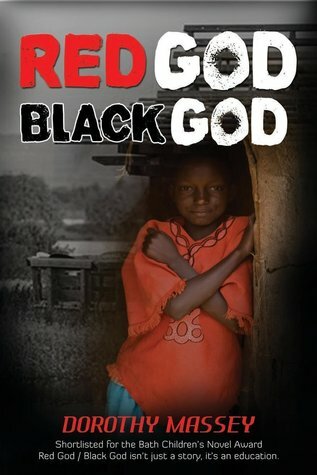 Red God/Black God is a contemporary real life drama set in the heart of a Maasai Community in Kenya. The novel explores family relationships and the transition into early teens through the eyes of a young Maasai girl, Neema, whose tribe is undergoing a parallel transition – attempting to uphold traditional values against the encroachment of modern-day advancement. The warring red and black gods of Neema’s favourite legend represent her own individual struggle to make sense of what’s going on around her and gain a much-desired education. I wrote the book with a target audience of upper primary, lower secondary in mind, although it’s creating a lot of interest among adults too, who are buying it not only to gift to younger people, but to read themselves. It’s difficult to place Red God/Black God into an age range. My aim as an author was to be inclusive – when people choose to read my book, I’m delighted whatever age they are. The issues facing the main character, Neema, may differ from those experienced by teens in the west, but the themes of family, community and coming of age are universal. It’s a book for anyone who likes contemporary realistic fiction, particularly those who enjoy learning about different cultures. One reviewer wrote of the novel, “it’s not just a story, it’s an education.” Whilst my focus was on telling the story, I do like to think that readers are left having learned something new, or come away with a fresh perspective. You’ve taught English, Literacy and Creative Writing for many years to students of all ages. Do you have a favourite lesson / class / age to teach? I love working with people of all ages, but if I’m completely honest, I particularly enjoy the late primary/early secondary year groups, which is also the age group I prefer writing for. I’m passionate about literature, so whether it’s discussing novels, plays and poems with a student, helping them produce and improve their own writing, introducing a student to a new writer, poem or book, I love it all. One of the many aspects of your novel our reading panel loved was the vivid depiction of the setting. What do you think is the secret of writing successful settings? One tip is to try and encompass all five senses in your description so that the reader gets a multi-sensory experience. They should not only be able to see the scene, but hear, smell, feel and possibly even taste it. Also, although it’s been said so many times it’s almost a cliché; read as often and as widely as you can. All craftsmen and creatives learn from the masters and writing is no exception. There are many imaginative ways to immerse yourself in the setting, without actually being there physically. When writing about Africa, I used notes taken during the visit, but also read fiction and non-fiction books, blogs and articles. I looked at photographs, watched videos and television programmes set in Africa too. At present, I have a bookshelf dedicated to forest life which may provide material for the background and setting of my new novel, Forest of Imaginings. My main character, Tarnock, must spend a year in the forest, to prove his worth of becoming elven king. So I have reference books on trees, flowers and wildlife, as well as books on forest folklore and other forest-themed children’s books. I have a notebook filled with ideas, information and photographs from visits to Hamsterley Forest, which is local to me, and a visual representation of the changing seasons on DVD. I refer to these resources during and before writing sessions, for inspiration and information. Your short stories have won several prizes. What do you love most about the form? Short stories are often more accessible to the reader, particular emergent readers and those who find reading a challenge. As a writer, the short story format forces you to tighten your prose and your plot line. Some of the children who took part in our Young Judging panel for the prize have been inspired to write their own short stories for competitions. Any tips for young writers on how to make their story shine out in the entry pile? My advice would be to make every word count. Write a story which delights, amuses or moves you. If you love it, the judges are more likely to love it too. Then make sure you don’t exceed the limit. If your story is too long, and even if it isn’t, ask yourself if every word and sentence is the best you can produce. How was waiting to see how far Red God/Black God progressed during our Children’s Novel Award? Both exciting and nerve-racking. I didn’t sleep well the nights before the shortlist and longlist announcements. I was so thrilled to be longlisted and even more so to see my name on the shortlist. We’ve read that your favourite children’s book is Skellig by David Almond. What do you love about his writing? I bought a copy of Skellig at an author visit to Bishop Auckland Writer’s Group shortly after it was first published and it remained my favourite children’s book for many years. Having recently read David’s A Song for Ella Grey, however, I’d now find it impossible to choose between the two of them. Almond’s writing has so many qualities I admire; unique voices, memorable characters, fabulous depiction of settings and relationships. David Almond is a writer who is not afraid to explore the vulnerability of humanity in his novels and does so in prose which has a beautiful lyrical quality. Has your shortlisting had any impact on book sales or traffic to your website? Yes, the day after I discovered I’d been shortlisted, I opened the Christmas fair at my local church and experienced my first book signing. It was a very exciting and memorable weekend and I sold more copies than I’d expected. Being shortlisted has encouraged me to step up my marketing strategies considerably. I’ve redesigned my website to include a blog, Writing Out, and am soon to launch a second edition of Red God/Black God, which celebrates my success by way of a tagline on the front and Sallyanne Sweeney’s comments on the back.Recently, I discovered that I’d sold my first copy of Red God/Black God in the States. It’s fabulous to see it gaining exposure outside the UK. Copies have also reached Kenya. Kennedy Nganga, the artist who designed the cover image and who runs a mission to educate girls in Kenya, now has several, and I’ve recently been able to send some to the Maasai Community via Maa Child, a charitable trust who also provide educational opportunities for local girls. You’ve published Red God / Black God independently on Amazon. How did you find the process? It was challenging! The worst part was formatting. Although I used a template, this was a laborious and frustrating process as every slight edit would throw the alignment out and I’d have to adjust page after page to get it right. I did everything myself; editing, proofing, cover design. At times I must admit, I regretted this decision, but the sense of achievement on publication was amazing. I learned a lot during the process and have learned even more since. This time round I’m hiring someone else to do the formatting and help with cover design. The biggest pro is having control over the complete process. The cons are having to do everything yourself or pay to have someone do those things for you. Marketing in particular is a bit of an eye-opener and there are so many options. There are many experts eager to ‘help’ – numerous marketing tools and platforms to consider, but many charge considerable fees. I took advantage of as much as I could for free and monitored the results of each marketing campaign, at first on a weekly basis, then monthly. Now I will pay for a service, but only if it’s reasonably priced and has proven results. There is still a prejudice towards self-publishing and people tend to assume that traditionally published books are better quality. For that reason, having my novel recognised by the award panel gave me much needed recognition and a sense of validation. Self-publication can lead to books which are published before they are ready. However, it is possible to find professionally published books which are substandard or poorly edited too. Did you consider the traditional publishing route and / or seeking literary agent representation? Is it something you’d be interested in the future or are you happy as you are? My ideal scenario was to get agent representation. At first I was set on the traditional publishing route and hoped to find an agent to represent me, leaving me free to edit and write. I did submit to a handful of agents, whilst simultaneously submitting directly to a couple of publishers and entering a couple of competitions, but the process was long-winded and frustrating. The decision to self-publish came as a result of a couple of coincidences. I was at a local writing retreat when one of the other participants asked about self-publishing. Two local novelists, Wendy Robertson and Avril Joy, talked about their experiences of publishing with CreateSpace. Wendy had many years of experience in traditional publishing, but had recently reissued her novels through the self-publication route. CreateSpace’s publish on demand option eradicated my greatest worry about self-publication which was paying upfront for a sizeable print-run, with the risk of being left with a pile of unsold books. I would like agent representation and/or to be taken on by a mainstream publisher, but I’m happy with the self-publishing process and pleased I decided to go down that route. I’m writing a fantasy novel called The Forest of Imaginings, which is about two thirds complete. Marketing and relaunching Red God / Black God has taken priority lately, but I’m hoping to at least have the first draft of The Forest of Imaginings completed this year. I also write poems and books on the website Storybird.com. Some of these are joint ventures with my pupils, one of whom introduced me to the site. You’ve written a Guide to Creative Writing Workshops. Tell us about your favourite chapter / topic? I hadn’t thought about that before, but two workshops immediately come to mind. The first is on character development and the second on setting. The character development workshop involves reading diverse examples from Charles Dickens, Nick Hornby and Isa Dewar before completing a range of fun character-developing exercises. I’ve adapted these exercises in practice to a range of situations which work with adults and children in group and one-to-one sessions. The other workshop comprises of reading and discussing descriptions of a fantasy and real-life settings. The main task encourages students to imagine the setting as if looking through the lens of a camera, panning out, then zooming in. This was the first time we’ve had a shortlist dominated by writers with MA’s. What was the best part of your MA? The MA was a life-changing experience in many ways. My two trips to Africa were both amazing and completely unexpected bonuses. I enjoyed the variety of modules which covered many aspects of children’s fiction, including history, publishing and psychology and met experts in the writing and publishing industry – people who were as passionate about writing and reading children’s literature as myself. But the best part was that although the MA officially ended when I graduated, the benefits didn’t end then. I’m still making use of what I learned and the confidence, tools, guidance and sense of accomplishment have all stayed with me. Above all, I have an amazing support network of people I met during my study. Lastly, our 2016 Children’s Novel Award opens to entries from 29th April 2016. Any words for writers thinking of submitting their novel?